This watch is a real eye popper. Its not for those who have small wrists, as the dial is larger than most watches. It's not overwhelming with shine, but the blend of Gold, black and subtle sparkles everywhere is simply beautiful. 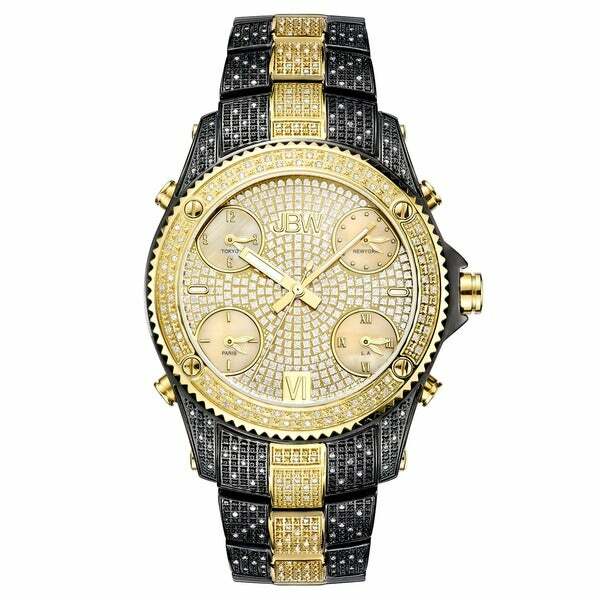 Add unique luxury to your wardrobe with this two tone stainless steel timepiece featuring 234 round-cut white diamonds accents. The bracelet has a 18 karat gold-plated case with a black finish and easy deployment clasp. Very exquisite time piece ! Looks great with any apparel you pair it with ! The black and gold makes this watch stand out above the rest ! Many , many compliments when wearing this watch ! It has the feel and look of a very expensive watch and the diamond detail really sets it apart from other watches ! I would definitely recommend this watch for the fashionable person who wants to stand out with this timepiece! Yes , I would also repurchase this product for a gift or any occasion ! It is simply stunning ! great looking watch really enjoy it. just wish it had some more color in the diamonds. This is a very beautiful watch. I bought this for myself and love it. It sparkles with all the diamonds and looks great on my wrist. Thank you overstock for bringing such great items to your customers. Wonderful watch! My boyfriends loves it! Definitely worth the price and then some! It was a little bigger then expected but it’s still a wonderful piece of jewelry! I will be buying more! I purchase a lady's JBW watch & we love it.